There are a lot of ways to accentuate your decor fundementals, but none as original and mood-setting as they are inexpensive and easy to do as lighting effects. 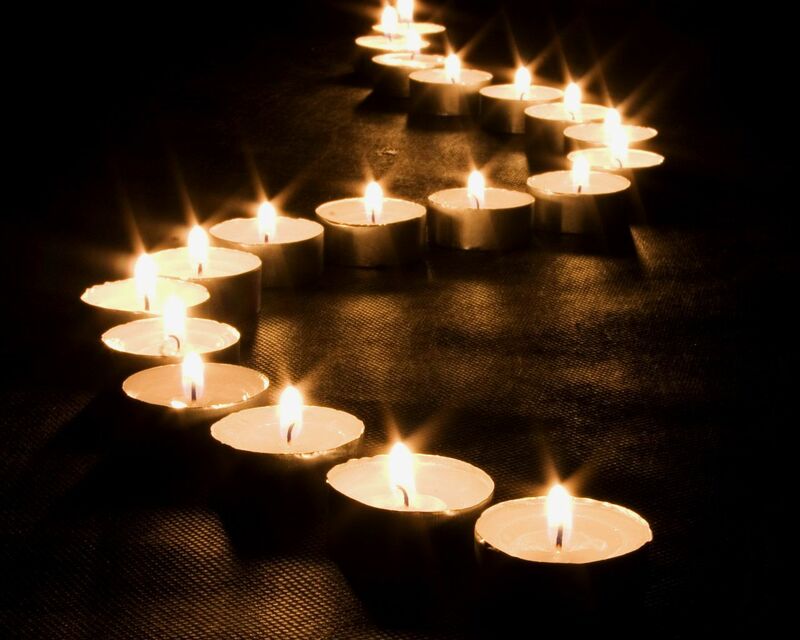 A few of those lighting effects we’ll look at at are: candlelight, lanterns, twinkle lights, and natural light. 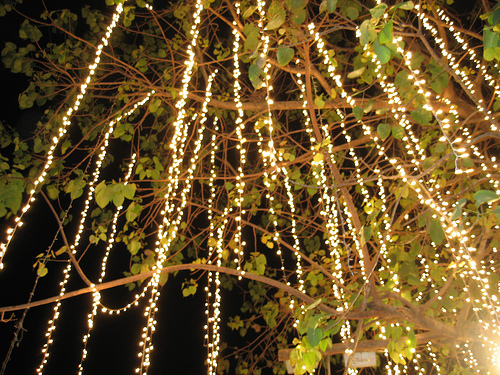 These are twig lanterns entwined with LED string lights, hanging from a tree. 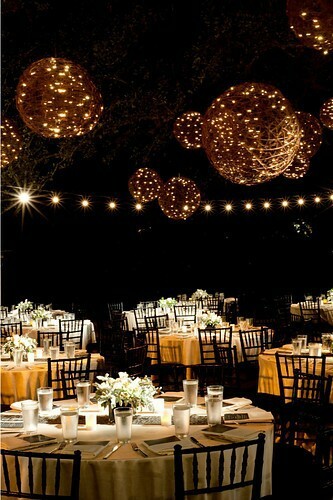 It creates such a beautiful atmosphere, with the lights playing off of the natural wood of the lanterns. These are a great DIY project. Twine in a good alternative to twigs. I love the idea of hanging twinkle lights straight down from a tree to create a weeping willow effect for a lovely backdrop. The daintier the lights the better here, as they’ll sway with the wind giving it an organic look in the spirit of a true weeping willow. 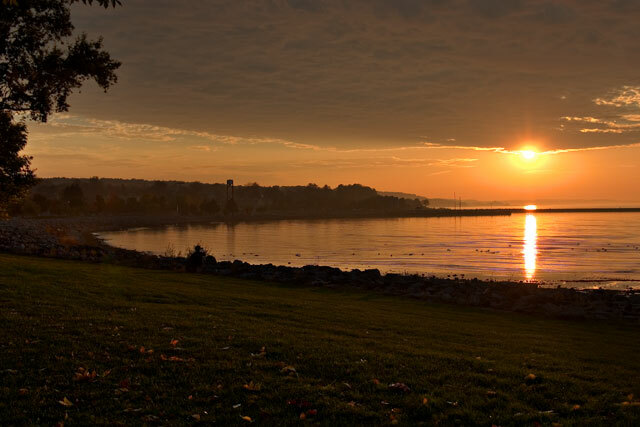 A sunset is the best form of natural light to use a backdrop. Holding your event near the water during sunset is a perfect way to see the colors lighting up the sky amplified by reflecting off the water. Just go for a drive. The trick to neons in your wedding is ensuring it’s used as an accent. Like ribbons, bouquets, bridemaids belts and shoes, small things that will really pop without overloading the eyes. And for a kids party, you can have a lot of fun with neons. An 80’s themed bash is the obvious choice for neon colors! 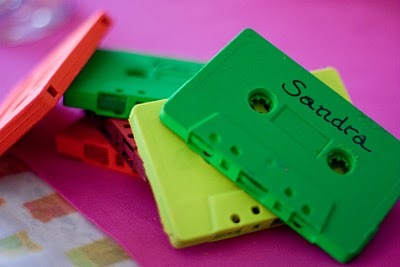 This party has cassettes spray painted bright colors with guests names written on them for the “place cards”. And for a party to remember, have a paint “ball” party with a neon dress code! For our local readers, there is a paintball facility right outside Fort Smith that has the guns and gear for rent and paintballs to buy in colors of your choice if you want the real deal, as well as some pretty awesome courses. But we suggest some paint/water filled balloons for all the fun and none of the bruises! Just call ahead and reserve the time slot and gear. Beforehand (or after paint”ball”, if you’re brave enough to have painted people in your house!) have your guests over to fill their tanks. Serve some fun bright drinks (pink punk cosmo, anyone?) and throw up some black lights in front of a curtain and set up a camera for an awesome photobooth your friends will love! For some extra fun, have each guest bring a few props, like feather boas and big sunglasses, to throw in a box by the camera. A fun way to express yourself and be sure to have a good time! This is Brooke bringing you the Trend of the Week. We see inflatables everywhere. Every kid wants them. Every adult secretly wants to play on them. 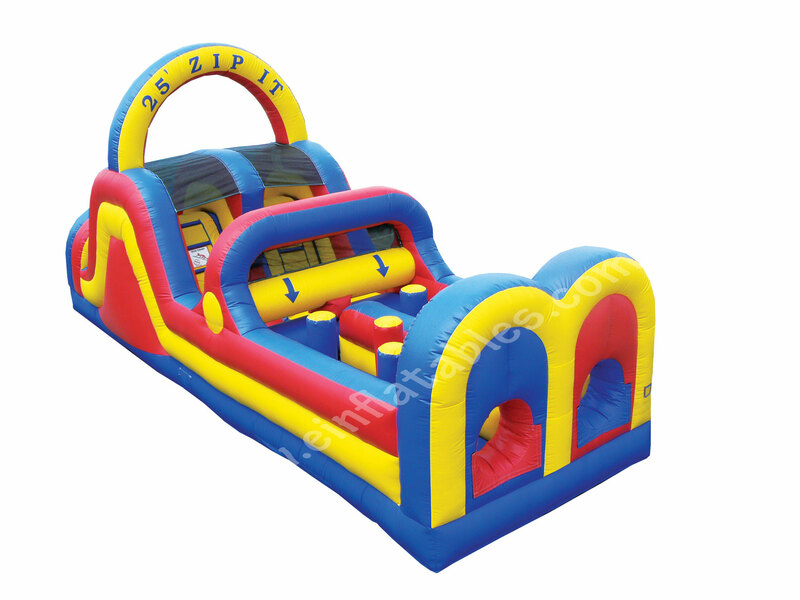 Whether a slide, bounce castle, obstacle course, or a combo inflatable strikes your fancy, there are sure a lot of fun options for them! You see these bad boys at kid parties ’round the block, rain or shine. But when do adults get to have them? When do we get to don our bathing suits and splash and waller and have water balloon fights? Here is a perfectly acceptable excuses to embrace your inner child, and for my local followers, pricing and pictures of inflatables our shop carries. These are the products we offer at The Loft that we would recommend for this neighborly shindig. Karaoke Machine-$69.00 a day. Includes two cordless microphones, speakers, screen, and music. 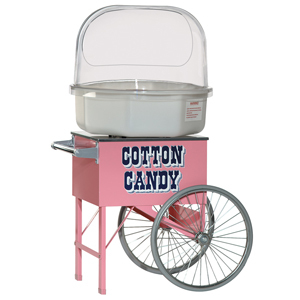 Cotton Candy Machine and Popcorn Maker-Each are $35. 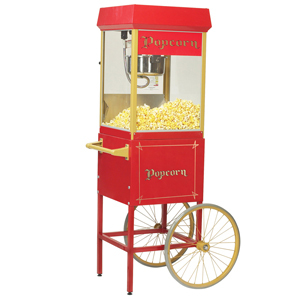 We have the sugar, cones, popcorn bags, popcorn, and all the flavors and bells and whistles you need! This obstacle course would be so fun to have a battle of the sexes race in. Even though we know the girls would win! It rents for $165.00 a day. 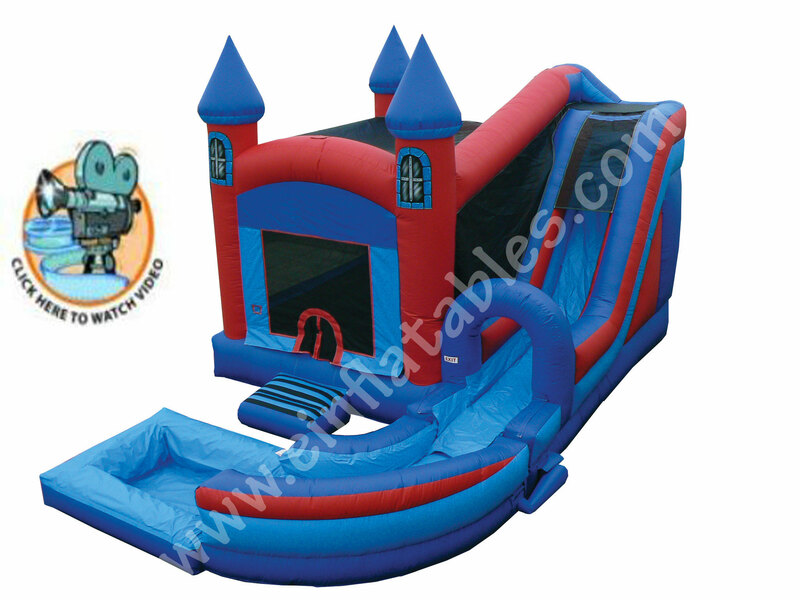 If you want a traditional castle bounce, we’ve got those! $99.00 a day. This one is really fun because it’s got a bit of everything to it. 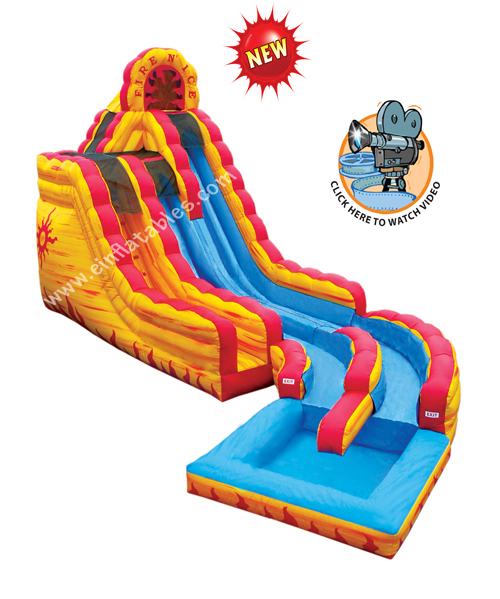 It has a basketball goal, wet/dry slide, and a nice big area to bounce in! It rents for $165.00 a day. And to occupy those guys while the girls are dancing the night away, we have a 5 sided “mini” sports area. Basketball, baseball, soccer, football, and dart and frisbee! 2 players per side is standard. We just bought this and haven’t gotten it in yet, so we haven’t got a rental rate for it yet. We do know it’s going to be the cheapest inflatable that can be used by adults, though. And what fun is a party without balloons?? You can get bags of balloons cheaper here than most anywhere else. We also have a helium tank customers are free to rent the tank for a few bucks, and you just pay for the helium used. 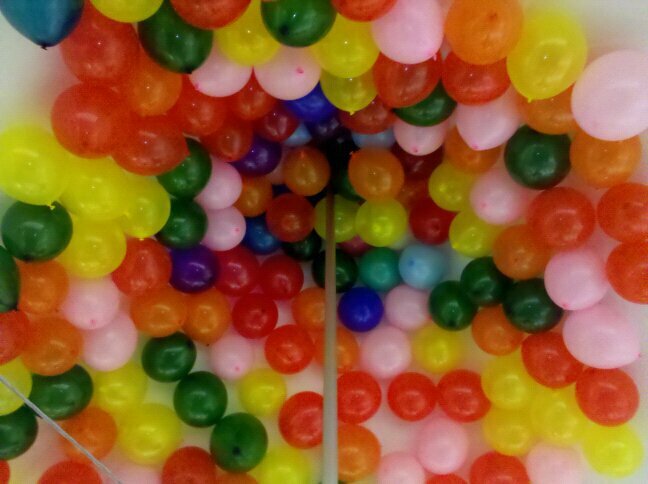 One tank uses about 60 dollars worth of helium, and does 900 balloons. So go crazy with the colors! Hope you enjoyed this post as much as I did coming up with it. And now I really want to have that party, so somebody better want to throw one I can plan and make fabulous for you and all your friends! We’re bringing you back close to home this time. This Bed and Breakfast is located in Hot Springs, AR. Just three hours from our very own Sallisaw, you will save money and time on this honeymoon destination. Located centrally in Hot Springs, you’re just a hop, skip, and a jump from all the hot spots in town, including the wonderful spas and restaurants the town in known for. 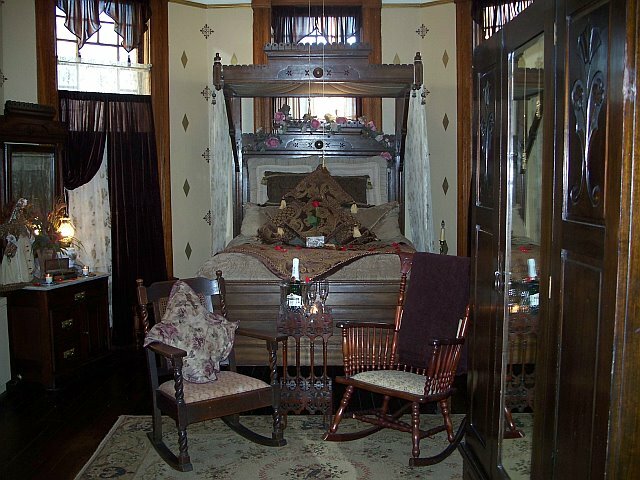 With it’s Victorian charm, and modern amenities, this Bed and Breakfast is sure to be the perfect vacation. The Rose Room is furnished with a truly lovely 3-piece antique Bombay bedroom set. The spacious room features a queen bed, private bath with shower, and fireplace with tea-light logs. 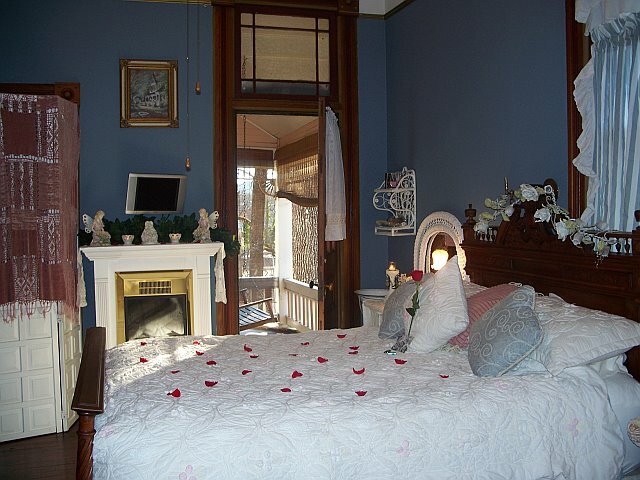 This room also has a twin bed for a third person and a quaint private porch with bistro set for your enjoyment. It was the original master bedroom; therefore it is very spacious and has a hidden safe in the wall. The beautiful white iron bed is king-sized. This room has a private bath with tub and shower. 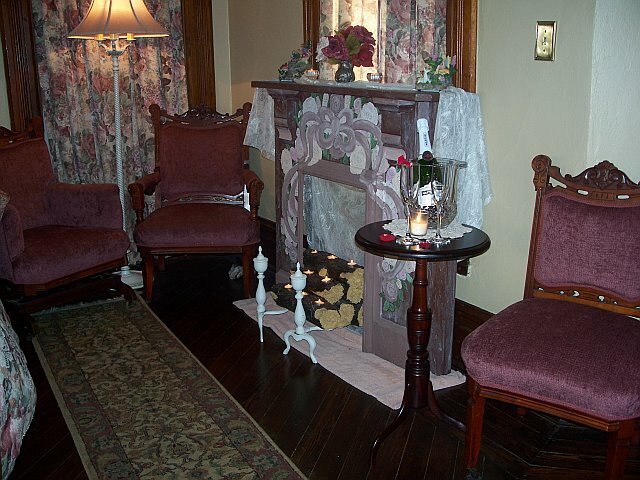 It is decorated in lace and silk and also has the fireplace tea-light logs to set the mood for romance. This room is often requested for honeymoons as it is separated from the other rooms. It is tastefully decorated in lush animal prints. The king-sized bed has satin sheets, and an overhead canopy that can be pulled around the bed. This room has a rainforest water fountain, fireplace with tea-light logs. The bathroom has a 2-person corner whirlpool tub with shower. This room also features a private entrance from the outside that has its own private sitting area. This room is regal with the high-back, half-canopy bed, which is part of a 3-piece set. The bed is queen size. The large bedroom gives you plenty of room to relax. 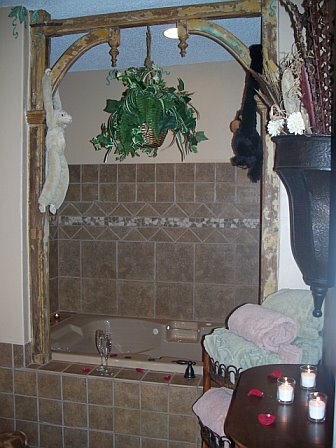 Enjoy a candlelit bubble bath in the antique claw-foot tub. They supply the candles and the bubble bath. This cozy room, decorated in blue floral was originally an upstairs parlor. It is furnished in an intricately carved 3-piece French bedroom set. We’ve added an electric fireplace that can be used with or without the heat, year ’round! The bed is queen-size. The flat panel TV has cable and built-in CD/DVD. The Blue Parlor Room has a private bath with a shower and a private porch with a porch swing. If you spend any time relaxing on the porch swing you may catch a glimpse of the resident raccoon! Outside of the lovely B&B, they have cottages available. Set up as a home away from home with a small kitchen they stock for you for your breakfasts and snacks, it’s a perfect getaway. 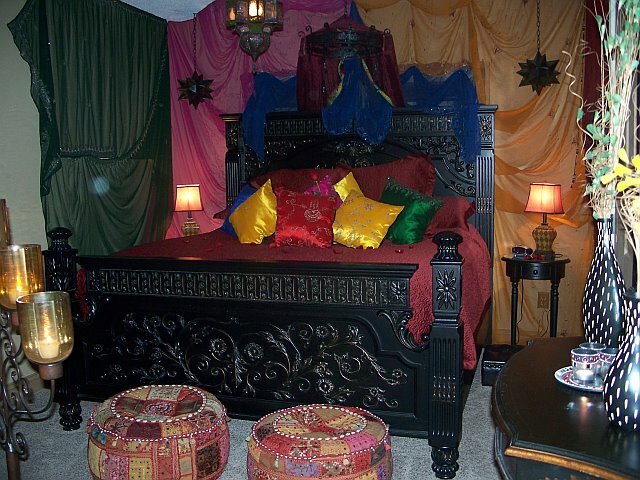 Enjoy a romantic stay with a Moroccan theme. Silk saris on the wall and stained glass lanterns. Fireplace has a candelabra, they supply the candles. Suite has a living area with flat panel TV and DVD/Cable, Wi-Fi available in the main house. Kitchen includes microwave, toaster, coffee maker, and fridge stocked with sodas, bottled water, orange juice and milk. Freezer stocked with breakfast foods. There will be a plate of homemade cookies and brownies waiting for you, as well. Sleep as late as you want, have breakfast on your timetable. Breakfast at the main house is not included in the cottages . Designed for privacy, we stock the suite with plenty of towels. This suite is not serviced for two to three night stays unless requested. Bedroom has king size bed with satin sheets, TV and DVD in bedroom as well as living area. Bath has whirlpool tub for two and separate shower. Romantic, cozy, inviting! This is a wonderful Bed and Breakfast. They have all the amenities you would expect, but they go above and beyond. You’ll find they have a complete library of movies for you to watch on the big screen in the living area, or on your personal TV located in your room equipped with cable and a VCR/DVD player free of charge. They have an amazing tour of the home you just can’t miss! We hope you’ll enjoy your stay, and let them know we sent you! 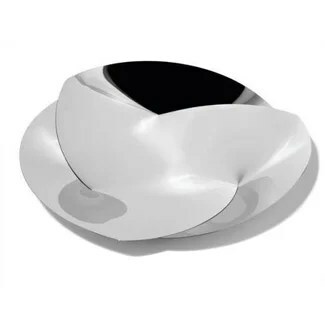 As you can see long tablescapes make a profound impact that seems to be a bit more powerful then the traditional round. 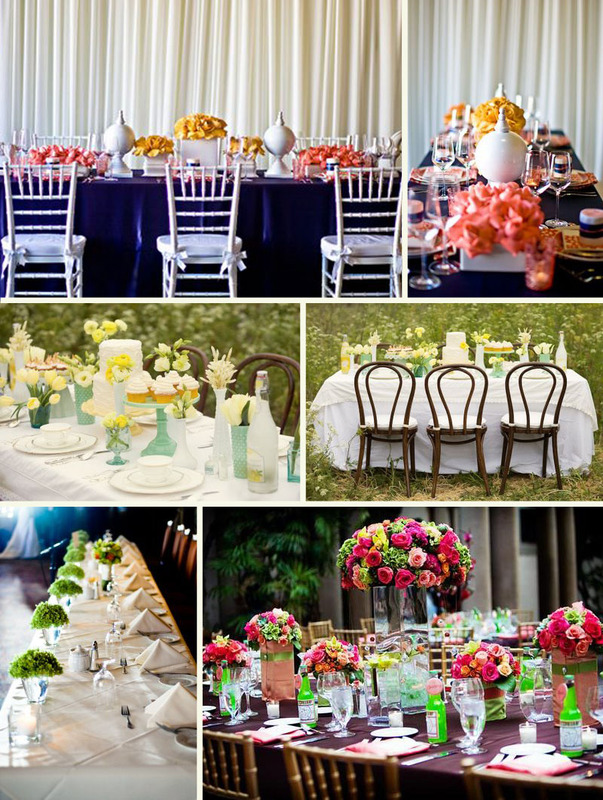 Something to consider when thinking about centerpieces, decor, and of course seating style. Often times whether this is an option has much to do with your venue and what choices they offer you. 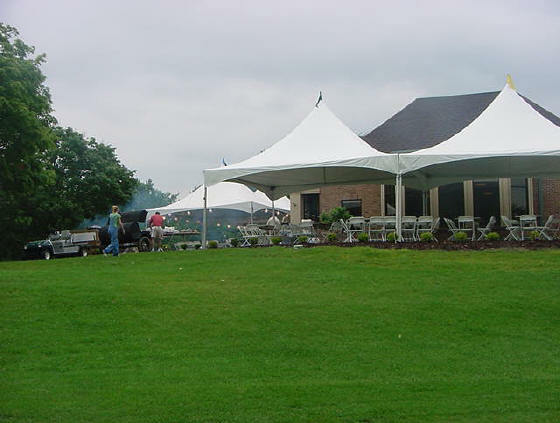 But more and more venues are offering buffet table length seating in addition to traditional rounds, so don’t be afraid to ask for the nontraditional. it may also seem a bit more spendy on the centerpiece budget but really its not when broken down. usually more guests seat at a buffet length table so you will have less tables over all then you likely would if you use rounds or smaller tables. often times this kind of event floor plan also can look more dressed up for the same amount of budget spent on a more traditional floor plan. any good event designer or florist can help maximize your budget and your space to be most suitable for your seating preference. 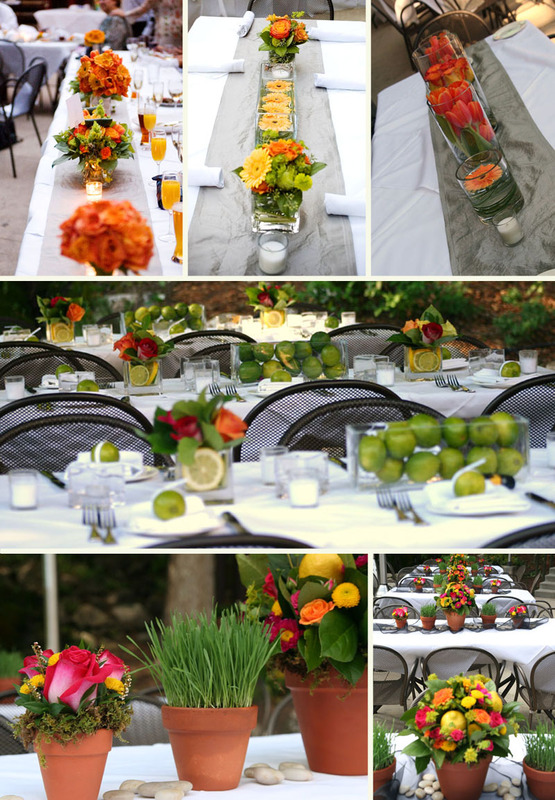 if multiple centerpieces appeal to you then length is a great way to go to achieve that desired effect. and also consider the idea of moving that powerful statement in your direction only with a looong head table to signify the focus of the day! After the big day is over you will want to make sure you send out your “Thank Yous”. 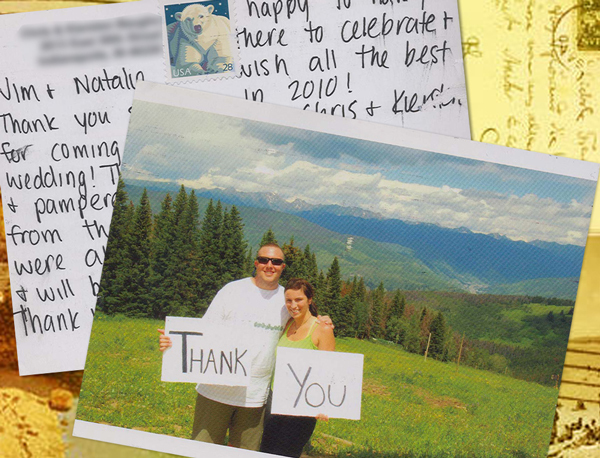 Many people send out a general thank you but others may write personal notes to each guest. Depending on whether or not you had a wedding shower before hand, guest may or may not bring gifts to your reception. If they do, you may want to write a thank you listing exactly what they brought. And of course, thank everyone for attending. 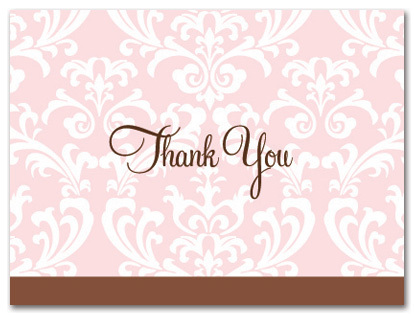 Here are a few trendy “thank yous” that you may consider. A simple store-bought card usually sold in bulk. 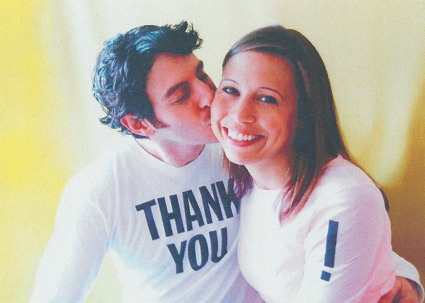 Shirts made showing off you unique personality as a couple! 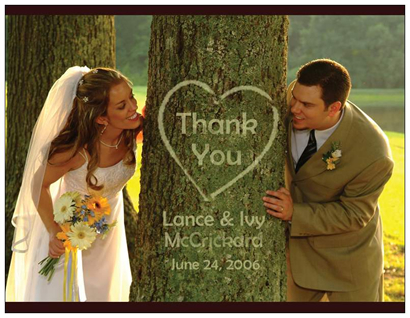 Make a sign that says thank you and hold it up during the photo shoot and simply send out a picture to each guest. Or use your imagination! This is super cute! Or take a picture on your honeymoon and send out a postcard/picture. “Thank yous” will be the last preparation you need to think of but don’t wait until the last-minute because you don’t want to be writing them on your honeymoon! Marriage orients men and women toward the future, asking them not just to commit to each other but to plan, to earn, to save, and to devote themselves to advancing their children’s prospects. Sure, sure a mirror on the wall is what you think should go in the title. Well you can definitely put a mirror on the wall, but how original is that? 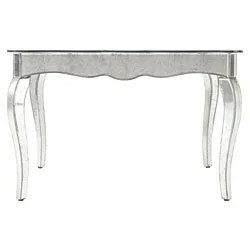 Mirrors are a great thing to incorporate into your decor, whether its your home, wedding, or any ol party. Here are a few ideas to get those wheels turning on how to bring this mod and sophisticated accent into your plans. No matter how or where you choose to use your mirror accents (like getting mirror circles and stringing them together to drape around your room!) it’s sure to be a display to turn heads. Thanks for checking out this post! Click like and follow if you enjoyed it! Go garage saling for a morning.